Etsy announced big changes coming to the Etsy forums later this month; an updated design, a modification to the structure of the forums and thread tagging. To get a feel for the forums as they stand today, we asked some tough questions of a frequent forum denizen – Janet aka Felton from Felt On The Fly. After nearly five years in the Etsy forums, Janet has the experience to dispense some sage advice to first-time forum-goers, or lurkers considering joining the fray. The mysterious world of the Etsy forums: it’s not your Grandma’s coffee klatch! It’s more like stepping into a neighborhood bar where you’ve never been before and deciding to learn the local version of a line dance already in progress. Brittany asked to answer some questions about the Etsy forums; I guess it’s because she sees me there frequently! Yes, it’s true. My name is Janet (aka Felton) and I’m a frequent forum poster. I think the best way to tackle this subject is just to answer Brittany’s questions as she posed them to me. She has some great insight into questions many newbies have about the forums. The Etsy forums at face value appear to be straight-forward; topic categories, posts and replies, forum rules. Yet from my experience, there seems to be a strong social underpinning. I’ve seen new posts in the forums elicit fire and brimstone from the regulars. I’ve seen threads go off on tangents of cookies, wine drinking and inside jokes. I’ve seen sellers post vapid advice time and again to new sellers or use a holier-than-thou tone. Can you describe the social dynamics of the forums as you see them? The Etsy forums are definitely a very “human” place and certainly have a “strong social underpinning” (man that’s a great phrase)! I’d also like to point out that posters are frequently passionate and opinionated – and I confess to liking it that way. One of the first things to know, understand, and accept is that words are just characters typed on a screen. Any “tone” or “attitude” might be your perception alone. Words on a screen can’t convey the author’s intent, nor can they show body language – a key component to good communication. Add into the mix that there are so many different personalities, cultures, levels of sleep deprivation, caffeine consumption and even some drunken posting, and the mix can be quite volatile! Your powers of observation are spot on regarding the cookies, wine drinking, inside jokes and more. Many of those posters have probably “known” each other for years, or possess an uncanny knack for fitting in seamlessly. Just like the analogy of the neighborhood bar, there’s history that’s hard to explain. Google will help you through some of the unknown terminology, and there’s room for everyone. It’s just a matter of familiarizing yourself slowly. Just so you know, it’s rare for a poster to never draw a jab here or there. It happens. That’s why Teflon pants are part of every experienced forum poster’s wardrobe. Preferably handmade from organic Teflon. How has the forum landscape changed since you joined Etsy? Have things gotten worse, better, or just different? The changes in the forums over the time I’ve been here (four and a half years) have been major. The people, personalities and passions seem to be the same, but the rules and the setup have altered dramatically. Etsy likes to say that the forums are a place for sellers and buyers to ask questions about the site and get business help. The forums also serve as a “break room” for sellers and buyers alike. So many of us sellers work from home and can feel isolated. At the click of a button we can find ourselves with other people, presumably similar to ourselves, and with whom we have Etsy in common. Back in the day, there were a lot more sections in the forums. Each section had it’s purpose, similar to today’s forums; waaaaaay down at the bottom of the forums page was the wild, untamed, rarely monitored “Etc.” section. No discussion of Etsy forums would be complete without mention of this section – and it is dearly missed. That being said, it’s probably the single biggest reason the forums were “tightened up” a few years back. I’m guessing it was for the benefit of Etsy’s long-term business plans. Worse, better, or different? Well, people are people. They’ll always act like people. With all of our beautiful colors, pastel or fiery. That hasn’t changed, and it never will. The governance of the forums is problematic in my opinion. Rules have tightened up for sure. New rules have been introduced over the years. At a glance, the rules seem pretty straight-forward – but there’s the letter of the law, and then there’s the “intent.” Between the letter and the intent is a gray undefined area where posters have been known to tread and some get sucked into oblivion never to be heard from again. In any social environment, there’s a range of acceptable behavior. Depending on how far a person strays from that range, their behavior may be seen as quirky, irreverent, interesting, entertaining, enlightening, thought-provoking – or completely unacceptable and worthy of being eradicated. The trick is to know who holds the power to decide, what the limits are, and to govern yourself accordingly if you want to retain the “privilege” of posting. With the upcoming changes – fewer sections, larger print, no shop names listed next to avatars, no “last poster” listed in the thread summary – I’m afraid that Etsy is on a path to sterilize the forums to a point where it’s no longer possible to use them as a break room and for social purposes. In my opinion, that’s really a shame. At the click of a button we can find ourselves with other people, with whom we have Etsy in common. What are the common pitfalls that ostracize people new to the forums? Another common pitfall that will bring out the flamethrowers every time is starting a thread that, inadvertently or not, insults others. Everyone has a right to their opinion, but if you’re trying to avoid drama think very carefully about starting a thread that could be interpreted as an insult. A thread of this type raises the emotional level of subsequent posts. Somehow a “train wreck” thread becomes a fire that quickly rages out of control. Like all fires eventually do, it will burn out, but know that you’ll be scorched in the process. Repeatedly. By everyone who feels they’ve been insulted, and by those who are insulted that others have been insulted. This is where you’ll see evidence of that “strong social underpinning.” Suddenly, posters are coming from everywhere. Posts are appearing in a nano-second. The thread is moving quickly. You can feel the energy surging. You wonder how it is that all of these people are somehow finding this one specific thread. The social underpinning has some potent radar. How is it that people actually get to know others? For regulars this is a community, but for some it can feel like being the new kid that no one talks to on the playground. I can see how it might feel that way to the newbies, but most of the forum regulars love to meet, encourage and support new shops. When you interact with other posters by asking questions, sharing insight, expanding on someone’s post or acknowledging a post, you’re participating in the community and that’s a good thing. It won’t be long until you make new friends. I “know” other posters from all of the other sections in the old forums where less-structured conversation could take place. I’ve reached out to help sellers privately when I could. I’ve also purchased from a lot of sellers! Every interaction with the real people behind the avatars is a step toward getting to know other members of the Etsy community. Just be you. Bring your sense of humor, your unique insight, and a friendly attitude. Oh – and if you have an open mind, that’s probably the best characteristic of all. I’ve found the forum search to be abysmal, yet posters regularly get blasted for reposting topics that have already been posted. Additionally, if you actually find an old thread and post a relevant question, you might get blasted for resurrecting a ‘zombie’ thread from the dead. It seems to be a damned-if-you-do, damned-if-you-don’t situation – how can a seller that’s not in the forums all the time avoid this situation? Yes, the forum search is tricky – and something has happened to it recently to make it even trickier. I find it really difficult to search for specific things, but for general topics the search works pretty well. It’s not too difficult to search “SEO”, for example, and come up with plenty of posts to read. A general rule-of-thumb might be to search and read up if you suspect a topic might be frequently discussed. If you still have a question, go ahead and start a new thread – and it might be a good thing to mention that you’ve read what you could on the subject and need a little clarification. The problem with reviving an old thread is that, well, it’s old. Sort of like leftovers in the back of the fridge. Does anybody really want to see those leftovers again? People seeing the old thread for the first time when it’s revived on page 97 have to go back to page 1 to read the original post that was written 42 weeks ago. Something to consider about the forums is that the landscape and mood can change from day to day depending on what’s going on in Etsy-land. These subtle undercurrents may not be obvious to newbies, but don’t take it personally if you get caught up in the riptide. I know that can be hard. The problem with reviving an old thread is that, well, it’s old. Sort of like leftovers in the back of the fridge. How can someone manage their forum presence and keep up with threads given limited time in the day? Personally, I’d recommend not starting a thread if you can’t be around to respond as the thread develops. Some posters do, and some make mention that they’re off to pick up the kids or have a hip replaced or catch a flight to a place that serves drinks with paper umbrellas – which is preferable to simply disappearing. Why are some posts called out as thinly-veiled promotions (TVPs), but other similar posts aren’t? How does one post a valid question and have it read as such? Sometimes it depends on who is doing the TVP. Those who are new, or who rarely post and then start a thread not-so-subtly urging others to look at their shop will get called out for being possible TVP’ers. Outrageous post subjects that can only be logically justified as “I’m trying to get your attention cause I really just want you to look at my shop” qualify as TVPs. Some subjects just cannot seriously be taken as anything BUT a TVP. On the other hand, just because someone shouts “TVP!”, that doesn’t make it so. If it’s an honest question, say so. If it’s really a TVP – well, you’ve been warned. Getting back to the “strong social underpinning” and the social cliques that develop on Etsy, there are shenanigans at work. Some TVPs aren’t called out as such because they’re actually a bit of a game supported and encouraged by other members of the social shenanigansters. Those TVPs are sort of tongue-in-cheek (jeez I hate that saying). It’s a subtle difference, I know! Does posting in the fora automatically initiate a shop critique? (I thought this was against the “rules” but it seems like anyone who starts a thread is subjected to a slew of people investigating their shop, sales, feedback, etc). Is this something that people should just expect when posting? Good question! Posting in the forums will draw shop views and, depending on the subject of the post, people may just poke around in your shop a bit to make sure you’ve dotted your Is and crossed your Ts. There are the people who think they know everything already and are happy to point out all of the areas in which you’re (supposedly) lacking because it makes them feel uber-special and important and smart. Maybe they are – who knows? Look at it this way – maybe someone will suggest something you haven’t thought of, or were previously misinformed about! It’s frowned upon to issue an unsolicited critique, yet unsolicited critiques happen frequently. We’ve been told that responding to a poster is not an invitation to critique. I’m not sure if this is a punishable offense though. What are the most positive aspects of the Etsy forums that you find luring you back? I’ve learned sooooo much about business – internet business specifically, as I’ve had plenty of real-world business experience. It’s also the community of coworkers and the daily interaction about our experiences and struggles to be successful. The sharing of business practices. I love the crazy things that can develop so unexpectedly. I’ve laughed right out loud countless times. I’ve done the head/desk thing. I’ve been shocked and angered and motivated and enlightened. The forums are my break room; it’s all good. I met some women in the forums years ago. We became fast friends, started an off-Etsy forum where we post throughout the day, every day, and we try to meet up once a year in person. I have a little story to share too. When I first started here on Etsy, there was an amazing Etsy seller who was kind, helpful, and very generous with newbies in the forums. He became ill and died. When his death was announced in the forums, post after post after post mentioned his kindness, helpfulness, and generosity. I was so touched at the outpouring of emotion and appreciation. I believe that one of the best ways to honor a person is to carry on their legacy as best you can. Whenever I can offer help to someone in the forums, I do so in the memory of that nice man who left such a good impression on so many people – his coworkers, his break room companions. Janet Wieczorek of Felt On The Fly has a serious passion for felt; for well over 10 years she’s researched the history and cultural impact of wool and has collected and compared wool felt from all over the world. Follow her felty foibles on her Felt On The Fly Facebook page. 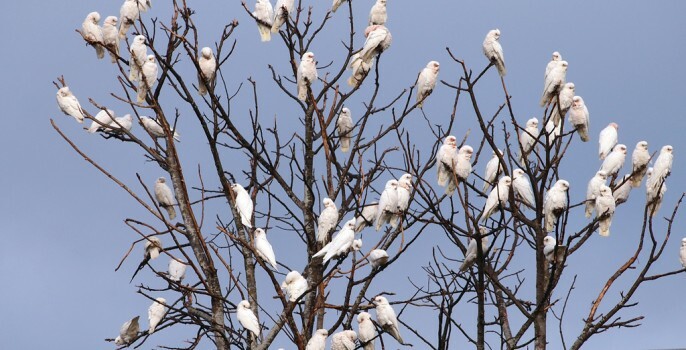 Cover image: Corellas by Patrick M on Flickr. This is a really well done article on both your parts. Fantastic article. I often read Janet’s posts in the forums with great pleasure, as do a lot of other well respected Etsians. I don’t think anyone could have described the Etsy forums more accurately or with as much insight. Well done Janet and thank you to Brittany for such a fantastic site. Just to add, you will find the very best of people and a very real community in the Etsy forums who hopefully outweigh the very worst of people who you will also find there.